A glut of acorns in the New Forest in the Autumn of 2010 is believed to to have caused the death of more than 30 ponies in the New Forest in Hampshire UK. The deaths of these ponies from suspected Acorn Poisoning follows an exceptionally large crop of acorns which fell early in the autumn this year. Acorn Poisoning causes liver damage in ponies and horses. Some ponies will get a taste for acorns and will gorge on them. Pigs have been let loose in the New Forest to eat up the acorns. Pigs can eat acorns without being harmed or poisoned by them. It was an medieval custom to graze pigs in the open forest and more are now being released onto the Forest Land to try to protect the horse and ponies that graze there. The number of pigs let loose in the New Forest has been now been doubled from 300 to 600. Although the release of more pigs into the Forest should reduce the number of acorns it is beleived that more ponies will die as a result of acorn poisoning as the toxins take time to show the effects. HOW MANY PONIES ARE THERE IN THE NEW FOREST? Around four thousand ponies wander and graze freely around the 141,097 acre New Forest National Park. 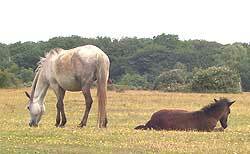 These New Forest ponies are owned by residents of the New Forest who have grazing rights to the Forest attached to their property.